In-game events, a new browser extension, token giveaways, and more! Greeting Guildmates, and welcome to the third round of State of the Guild. This is Fabio, the Marketing and Community guy at BitGuild, and from now on, I’ll bring you a bi-weekly breakdown of what’s going on here at the Guild. First up, we’ve had some in-game events planned for our gaming community! To celebrate the launch of quests and crafting, the team at CryptoDungeons ran a special giveaway and rewarded the first 3 players to craft certain items with a share of a 1ETH prize! They managed to get people crafting in only 3 hours! Show us your crafting skills and try your hand at the game today. We’ve also gone ahead and removed Ether Online from the portal, in order to focus on more current titles. As for what’s going on with Bitizens… you’ll have to wait a little bit longer to find out what kind of holiday festivities are planned in Bitropolis. Following the initial release of GuildChat on both iOS and Android, the team has been hard at work fixing bugs and improving the overall user experience. The latest update sees a long list of optimizations, mostly focused on bug-squashing in preparation for bigger things to come. You can find out more about GuildChat on www.guildchat.io. We plan on launching our latest foray into the world of browser-based cryptocurrency wallet management — GuildWallet. This new browser extension, akin to MetaMask or Treasure, is built from the ground up with multiple blockchains in mind, offering users the convenience of managing different wallets from a single place. The BETA version of the app—which supports TRX—is currently being tested by a small group of users, and the extension is scheduled to launch on the Chrome Web Store very soon for free. Earlier this week, BitGuild was invited to appear on a panel discussion at a cryptogaming event in Shenzhen in China, deliberating on the topic of trends in the blockchain industry, discerning hype from reality in a young and noisy industry. It was a great opportunity to hear from game developers and blockchain games enthusiasts, and learn how BitGuild can better serve this ever-growing community. ABCC Exchange — Almost there! As some of you already know, we’re still in the process of being listed on a second exchange. PLAT can currently be deposited on ABCC, with a reward pool of 14 million PLAT, as well as 1.5 BTC worth of ABCC tokens being distributed to participating users. For more details, check out this blog post. Finally, we’ve started publishing in both Spanish and Russian on The Notice Board, with more languages to be added in the future. If there’s a specific language you’d like to see our posts in, let us know in the comments below! That’s all we got for you this time folks! 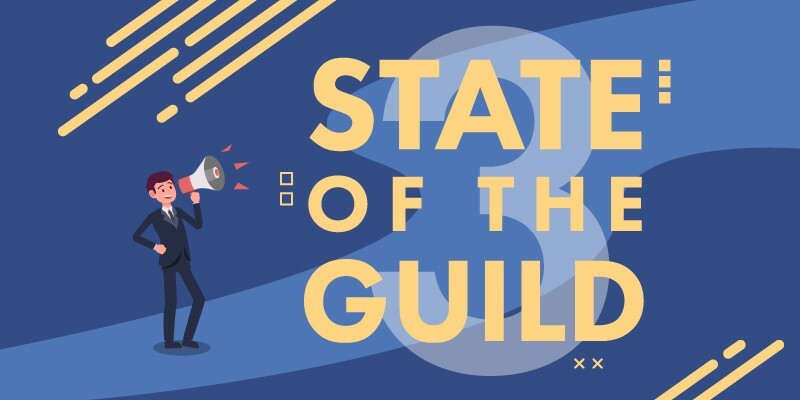 Please check back here in two weeks for another issue of State of the Guild. See you then! BitGuild aims to bring blockchain and cryptocurrency adoption to the masses by providing compelling experiences that are easily accessible. Between the officialBitGuild portal, our discovery platform for great crypto games, and GuildChat, our decentralized wallet mobile app with an integrated social suite, we’re firing on all cylinders to usher in a new age, changing the way people interact with their digital goods.